A transplanted Texan, Ms Crier grew up in the ranching traditions of the Southwest, where her family raised and showed Arabian horses for more than thirty years. Before college she competed throughout the United States, garnering several national awards. Cynthia received her BS in Architecture from the University of Texas at Arlington. She took her BA and Master’s degree in Architecture from Cornell with a minor in Urban Design. She is a registered architect in New York State and is an active member of the American Institute of Architects. Ms. Crier has over 30 years of experience in the architectural profession and has lived in New York City since 1987. Cynthia Bradfield Crier is the principal of Cynthia B. Crier, Architect. The firm’s focus is on residential work. Ms. Crier has been a practicing architect in New York City for more than two decades. Her extensive experience in retail, commercial, governmental and residential work was acquired with the New York City architectural firms of Kohn, Pedersen, Fox, Naomi Leff and the FDNY, New York City Fire Department. Commercial project work was both foreign and domestic and ranged from bank and office tower development in Jakarta, Indonesia to major media and corporate offices in New York City. Retail store design embraced the creation of fashion boutiques for, among others, Salvatore Ferragamo, Holt Renfrew and Armani in the United States and Canada. From 1993 to 2001, Ms. Crier was Chief Architect of the New York City Fire Department, FDNY, during which time she was responsible for budgeting, designing and managing construction of over half a billion dollars of work within the city. The Fire Department has 223 Firehouses throughout the 5 boroughs, of which, 75 percent are over 75 years of age. Notable among the projects she instituted is a comprehensive and ongoing program for the restoration and preservation of some of the city’s most historically significant buildings. The renovation efforts she implemented upgrade 19th century firehouses to 21st century technology without compromising their historic integrity. The Landmark Commission noted this effort with awards for the preservation work in 1997. In addition to the firehouse restorations, new Firehouses and EMS Stations were built and honored with awards for sensitivity and responsiveness to their contextual neighborhoods. Ms. Crier’s architecture firm has performed work from New York to Texas. The scopes of these activities have included numerous residential constructions and renovations ranging from relatively modest New York City apartments to multi-million dollar estate projects in Westchester. Ms. Crier’s work has been featured in the Home Section of the New York Times, as well as In Touch, Avenue, and Star magazines. Many Renaissance architects studied first as painters. Cynthia reversed that course over the past 7 years, moving instead from architecture to art. 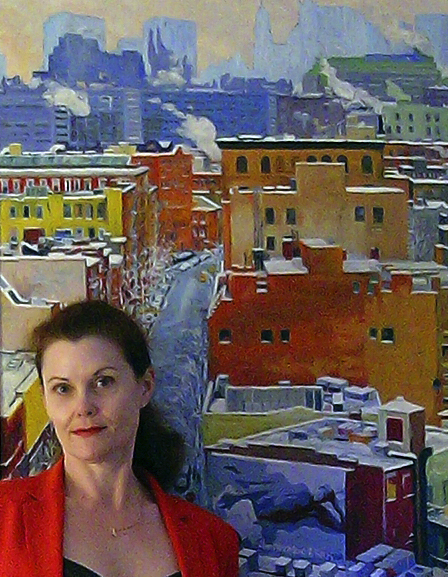 Crier’s education and professional career as an architect have given her the basic design principles that she brings to her paintings and photography. She brings that same purpose to her art, the desire to capture the city’s vital moments on canvas. The subject of her paintings and photographs is drawn from her dual passions, architectural built form and natural settings. Like a writer, she paints what she knows, ranging from scenes of her West Village neighborhood to landscapes across America. Over two decades as a practicing architect and resident of New York City’s West Village, she has observed myriad changes. The city is organic, and its evolution is accelerating. Like peeling an onion, the layers of a community reveal themselves, one then another, until the whole is exposed. Time, patience and intimate examination bring rich rewards to the persistent explorer. Every day, she discovers new inspiration and old secrets while walking her neighborhood streets. The changing seasons remake each landscape as she explores with camera and canvas. As a transplanted Texan, she periodically journeys to those open spaces seeking tranquility. Ms. Crier has driven over 50,000 miles, through 48 US states and Canada, painting and photographing the countryside. That freedom to work in the moment, without distractions of city life, is rejuvenating. Understandably, Cynthia’s studio work and nature paintings embody different expressions. Whether capturing a dramatic desert sky or the ornamental details of a glittering New York brownstone, Cynthia wants to express the joy in both the natural and urban landscape. In turn, she seeks to inspire the observer to enjoy the richness and beauty of man’s creations and nature’s elements. Ms. Crier is an award winning published artist and is currently a member of both, National Association of Women Artist and Pen & Brush. She is represented by Kornye Galerie in Ft. Worth and Upstairs Gallery in Arlington, TX.